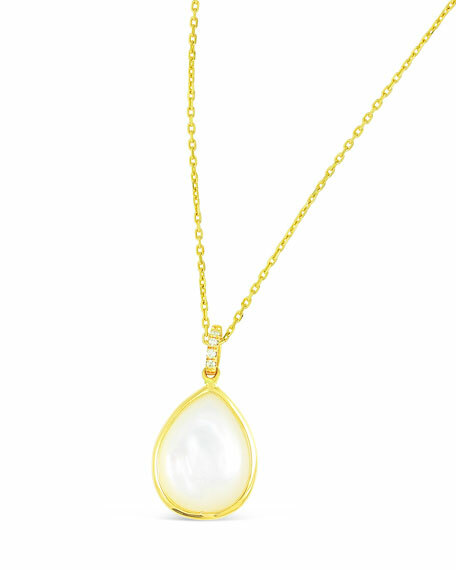 Luna teardrop pendant necklace by Frederic Sage. Linear bale with four round white diamonds. Frederic Sage began his career creating designs for a leading textile manufacturer where he perfected his eye for color and pattern, designing prints that were distributed worldwide. Eventually, with guidance from his father who, as an importer of precious gems had given him firsthand knowledge and experience in the field, Sage began to pursue his childhood dream of designing and creating fine jewelry. Using a variety of uniquely cut gems and fine diamonds, Sage combines influences he gained while living throughout Europe with his personal visions of color, design, and style to create contemporary jewelry for the modern woman.